This half term Bert and I have had LOADS of fun using the brilliant Chalkola Chalk Markers. 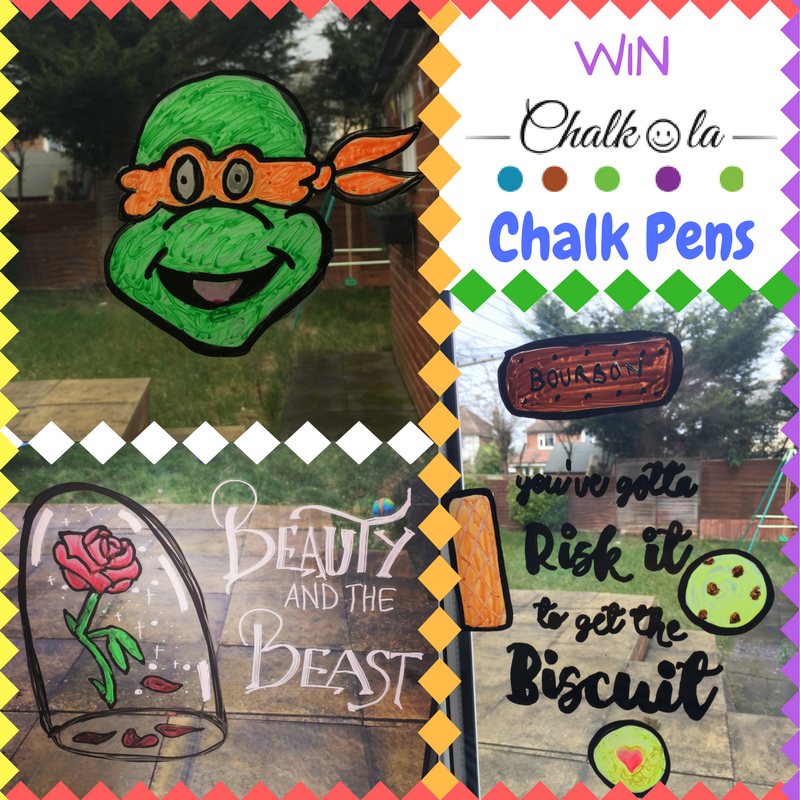 We were sent a pack of their 15 chalk markers (plus 6 metallic markers) and a pack of their premium series 15mm Jumbo Tip makers to put through their paces and have some fun with! The Markers are to be used on Non Porous Surfaces only like - Chalkboards, Whiteboards, Glass, Mirrors, LED boards, Plastic, Windows. And best of all they wipe away with wet cloth or window cleaner...amazing! The markers are child safe, water based, non toxic, low odour, acid free, xylene free, quick dry, long lasting and best of all...they wash off from clothing! Making them a brilliant option for keeping the kids entertained with minimum mess or fuss. Always a win in my book. 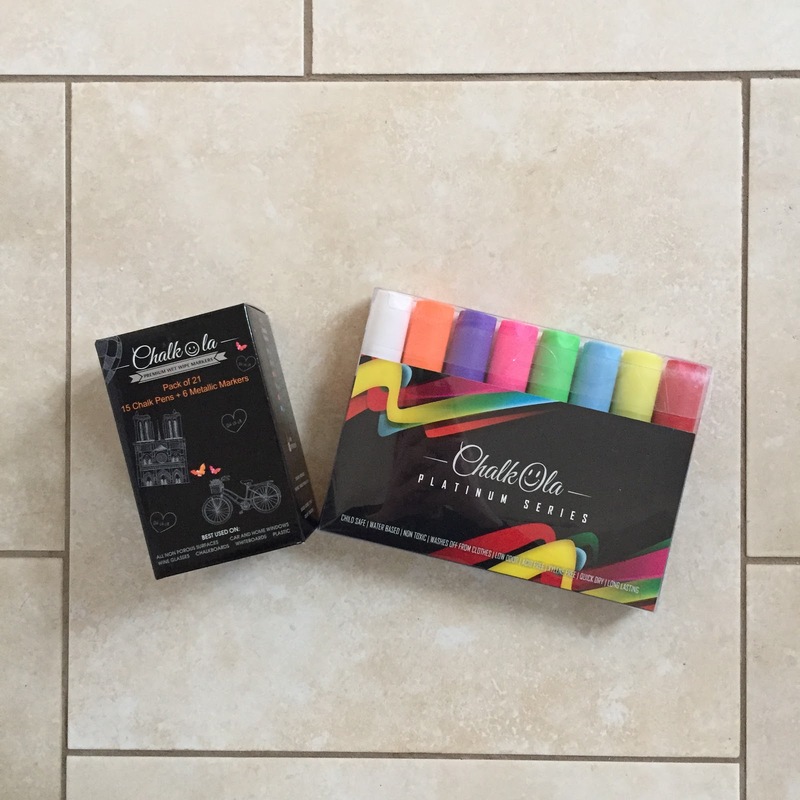 These chalk markers have high density Chalk Ink, due to which new markers take 1 to 3 mins prep time (pressing the tip to and fro multiple times to quickly get the ink flowing) once used the ink flows smoothly. We have found them so easy to use, and have genuinely had hours of fun creating bright and bold designs to decorate our windows. My little dude showing off his smiley face! 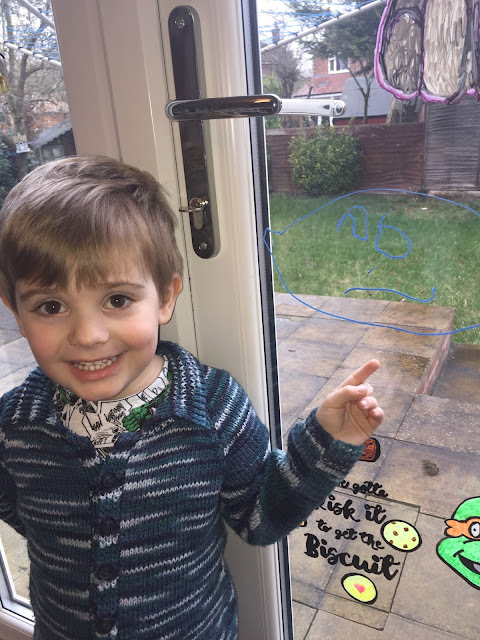 "Look what I've drawn Mummy!" 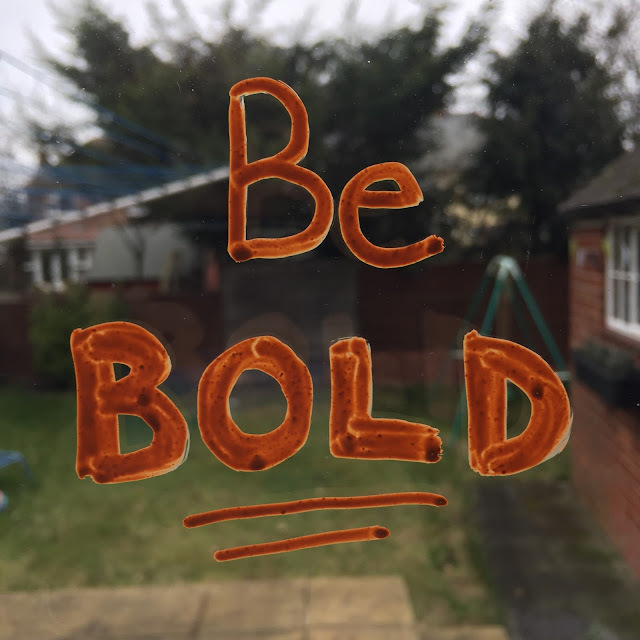 As well as Bert having fun with the markers, I've been channeling my inner-Artist too and have had a brilliant time decorating the windows around our home with drawings, motivational quotes, and even pictures of Bert's favourite TV characters. 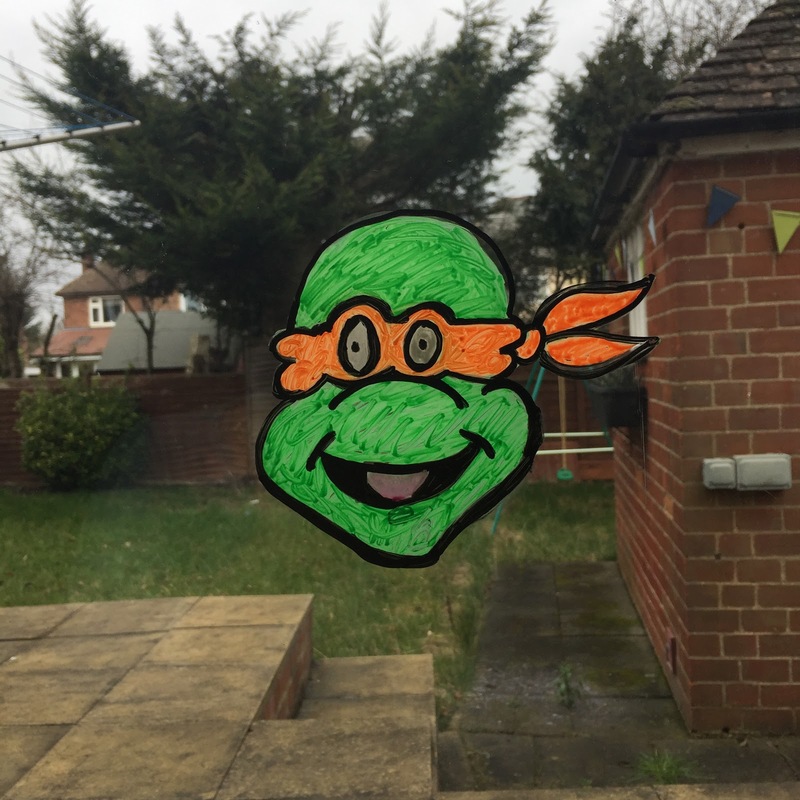 Bert's request - he is a Teenage Mutant Ninja Turtles fanatic! Can you tell I'm excited about the new film release next month? The uber-trendy Unicorn had to feature, naturally! 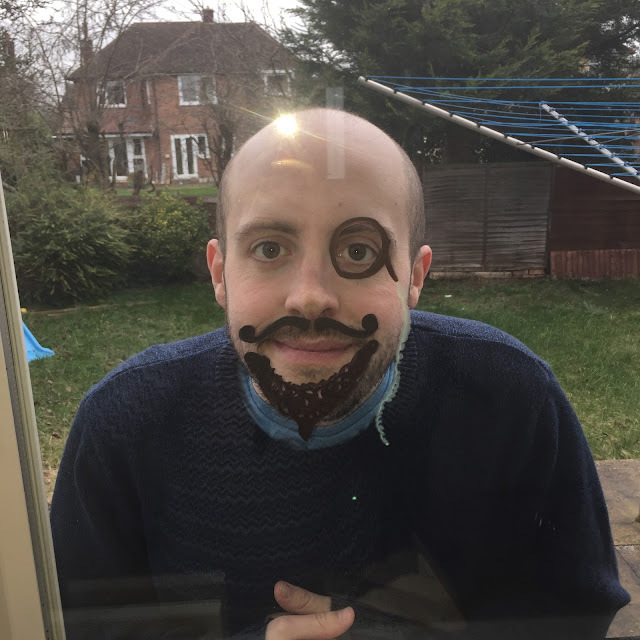 As well as developing our artistic skills we also used the chalk pens to be a bit silly...we drew beards, moustaches, a monocle and even turned Liam into Harry Potter using the pens. It was a fun way to play dressing up without using masks or costumes. Connie wasn't keen on playing! Haha! Daddy with a beard, moustache & monocle! I was so pleasantly surprised by how vibrant the chalkboard pens are on glass - the marks they make are as bold as using felt tips or markers on paper - they are so effective and bright. I'm chuffed to have these in my "things to do on a rainy day" ammunition box - and I'm pretty sure I'll while away a few more hours using them for my own pleasure too! 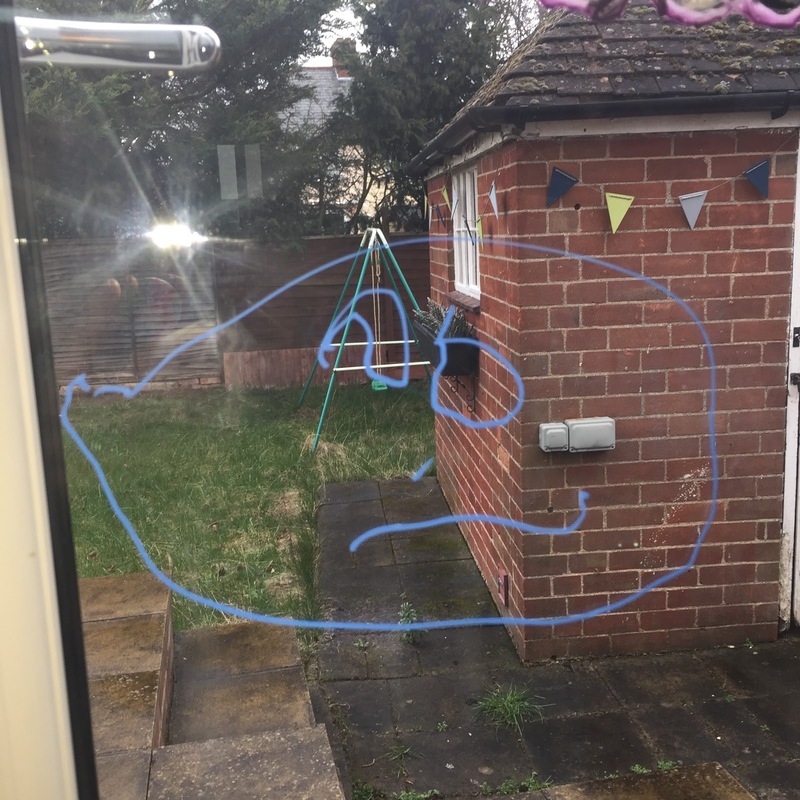 As promised these dry erase markers all wiped off easily with a slightly damp cloth - we've used them so much my windows have never been so clean! Ha! 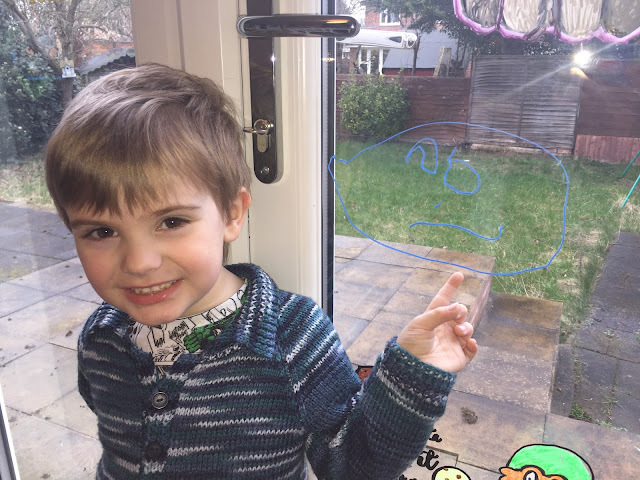 We were given a pack of 21 markers and 8 jumbo markers in exchange for this honest review. 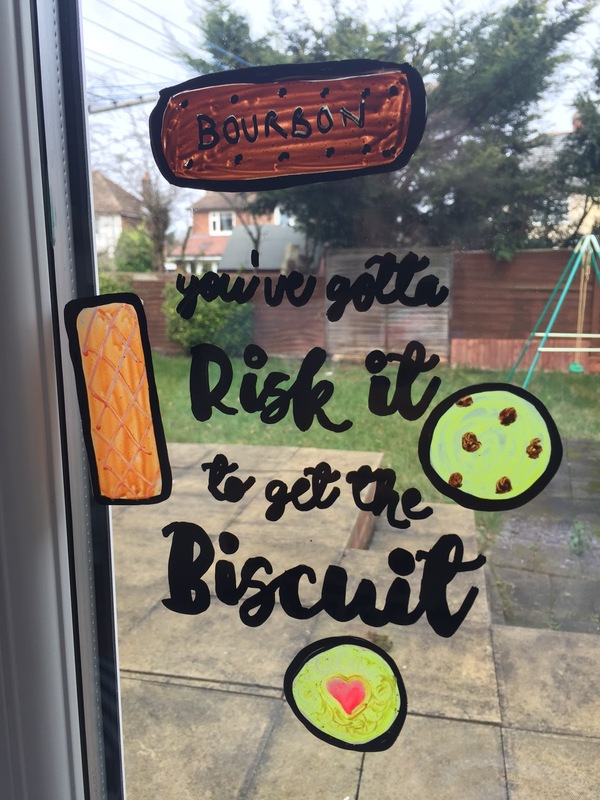 I love your mantra as I agree with it and share your love of good old retro Bourbons, Custard Creams and Jammy Dodgers!! I like the beauty and the beast picture, it looks so magical. 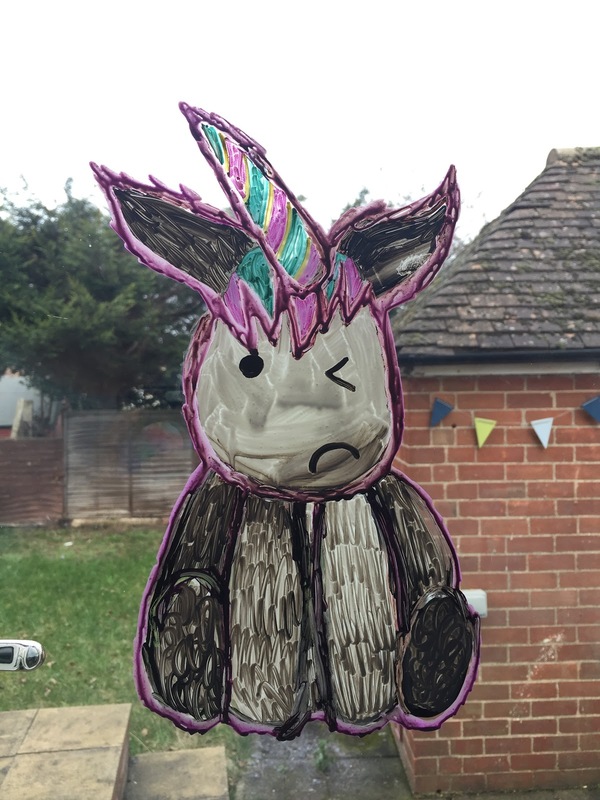 I love the Unicorn picture - you are creative! The Daddy Potter because it's funny. Beauty and The Beast is so sweet. I love the beauty and the beast one, my fave film. Daddy Potter made me laugh. If I am lucky enough to win I will definately try that. I love the mantra one but I do love the Beauty and The Beast one too - I think I am going to see it by myself so when I sing along I don't embarrass anyone other than myself lol. Some great masterpieces, but the bearded baby is excellent! ninja turtle as we love them! Daddy potter is fantastic!! 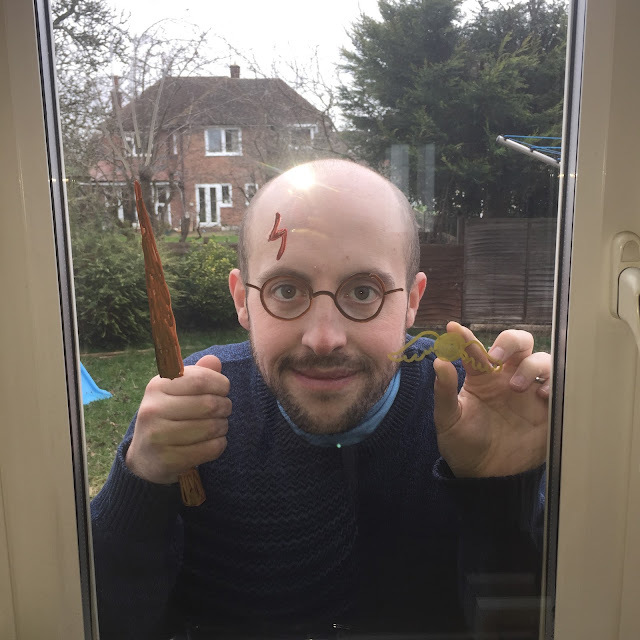 I am having a Harry Potter wedding and would love to use these for some brilliant photo's! Beauty and The Beast, great writing!! The daddy ones made us laugh! The Daddy Harry Potter was genius! The Ninja Turtle, he looks fantastic! Beauty & the Beast, one of my favourite films! The daddy potter! I could imagine us doing that. 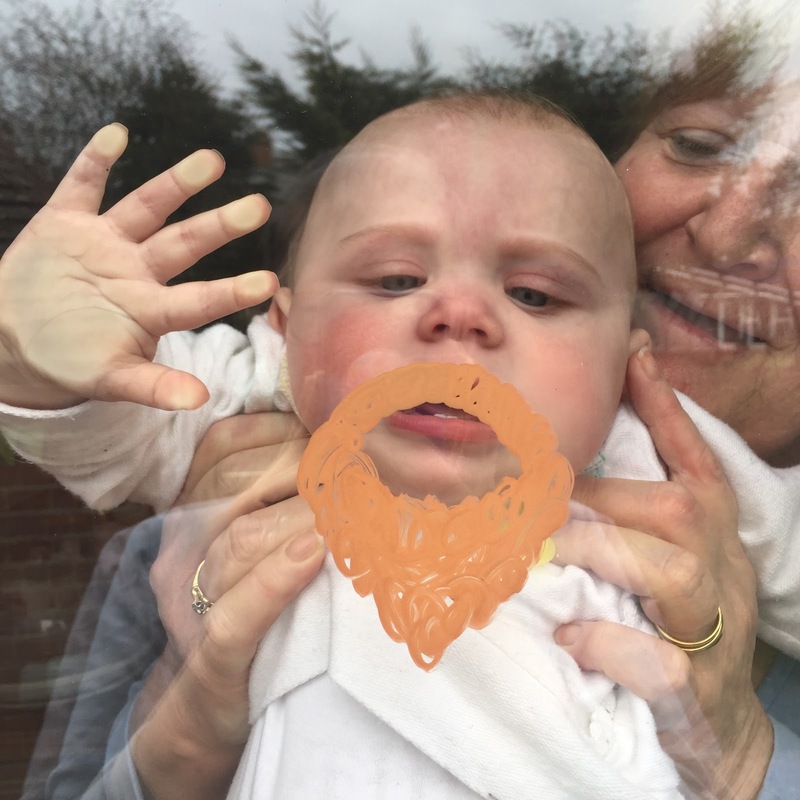 Love the beard on the window. Love the beard because it is simple and so funny. The baby beard. I'd like to take a picture of my niece and nephews like that. Ninja Turtle,My grandkids would love to leave out the eyes & stand outside & have their photos took.They love these Turtles. I loved the funny faces on your husband! that would be such fun for the children. I never realised that you could write on glass with them. I love the little beard! Love your Harry Potter one!!! Fab fun! Daddy Potter looks wonderful but all great pics. Harry Potter one because I love those films! I love your trendy unicorn - so clever and colourful. the beauty and the beast picture reminds me my childhood. I like the beard on the window. If we won, I think we'd decorate an old wall mirror. Ha ha love the Harry Potter one! daddy potter, I wouldn't have thought of doing anything like that, but now I think you can have so much fun using them in that way and take lots of photos too,the possibilities are endless, such a fun idea ! Loved the Beauty and The Beast one - it's very effective and BEAUTYful (sorry). Harry Potter in very funny! 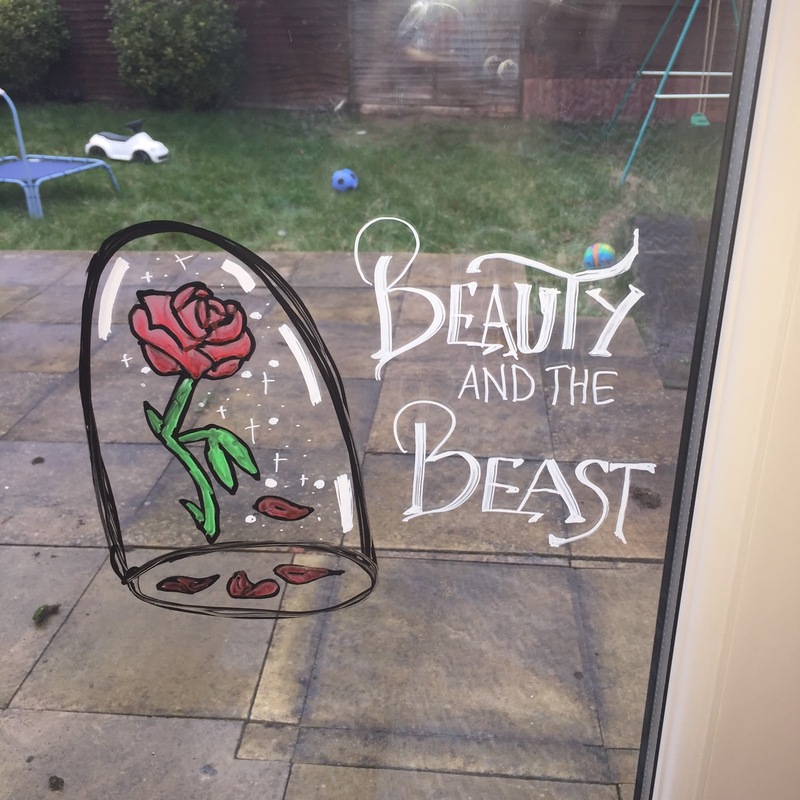 I love the beauty and the beast you drew it's beautiful i would of been tempted to leave it there! BE BOLD because it's a good philosophy for life! I know I'm late to the party, but your bambino with the beard was priceless!